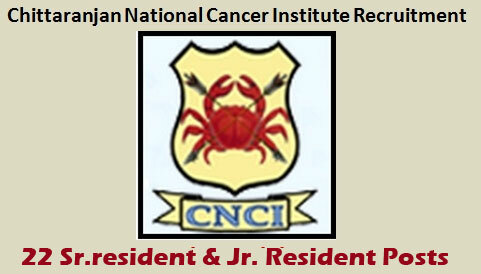 Chittaranjan National Cancer Institute (CNCI) has released CNCI Recruitment Notification-2018 for the post of 22 vacancies for the posts of Sr. Resident & Jr. Resident. The Recruitment has complete details about their notification on its official website i.e., cnci.org.in and www.careers99.com. This is a good news for those who are waiting for Central Govt Jobs. Candidates may apply offline before the Last date of the Notification i.e., 28/02/2018.And the remaining details for the recruitment like Educational Qualifications, Eligibility criteria, Age limit, No of vacancies, Post names, Pay scale, Job location, Application fee, Important links, Procedure to Apply are mentioned below. CNCI Notification-2018 has released on its official website cnci.org.in. the last date to submit the application is 28/02/2018. All the Eligible Candidates may Apply Offline before last date, and the remaining complete details for the recruitment are given below. Eligible and Interested Aspirants are requested to Download Application Form from Below link of cnci.org.in Website and Submit it to the mentioned Address before the Last Date i.e., 28/02/2018. Duly completed applications along with self-attested copies of relevant documents should be reached at to the Office of the Director by 28 /02/2018 positively by normal post on in person. The applications received after the prescribed date or incomplete applications are liable to be rejected. The list of candidates called for interview along with date and time of interview will be displayed on the Institute’s Notice Board and WEBSITE www.cnci.org.in on 15.03.2018. No individual call letters for interview will be separately issued.